Chocolate cupcakes are the ultimate party food for kids of all ages! Preheat oven to 350 degrees. Line a muffin pan with paper or foil liners. Sift together the flour, baking soda, baking powder, cocoa and salt. Set aside. In a large bowl, cream together the butter and sugar until light and fluffy. Add the eggs one at a time, beating well with each addition, then stir in the vanilla. Bake for 15 to 17 minutes in the preheated oven, or until a toothpick inserted into the cake comes out clean. Frost with your favorite frosting when cool. 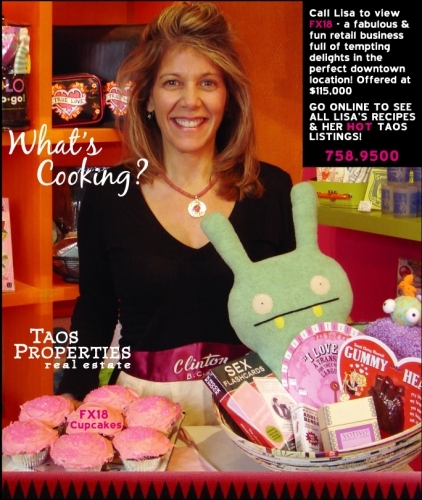 We are excited to represent one of the most fabulous businesses in Taos. Since 1995, FX 18 has become a local, as well as tourist favorite, in our community. Establishing itself as “the place to shop” in Taos, it has been voted as the Best Groovy Local Store in town for three years running!